The Style Guide, the new book by myself and photographer Jamie Ferguson, will launch next Thursday at Fenwick of Bond Street, from 6:30pm. There will also be a US launch event at The Armoury, in New York. Thursday April 20th. Details to follow. And it looks like we will feature in the bi-annual Crafted event at Bergdorf Goodman in New York. Today, we present an extract from the first section of the book, which looks at the style and practicalities around wearing sports jackets. A symphony of blues and texture here. Note that although the jacket, shirt and tie are all of a similarly casual texture, they remain effectively separated from each other by differences in shade and pattern. The soft, textured look fits with the bearded and tousled styling. Cream trousers are something of a theme in the jackets section of the book, because they’re just so useful. Here, simple colours and a neat cut create a chic outfit, elevated by a broad grin and plunging neckline. Note in particular the subtle check on the brown jacket and the trouser detail on the waistband, which is given special prominence by being the only dandy detail on display. A lesson in the anchoring power of a deep navy tie. There is pattern aplenty in the jacket (albeit subtle) and a thick stripe in the shirt, plus bright cream trouser. But the navy tie brings it all down to earth, giving the eye something calm and stable to rest on. The Style Guide is divided into four clothing sections: Jackets, Suits, Accessories and Casual. More extracts to come from other sections in the next few weeks. You can follow the discussion on ‘The Style Guide’: Wearing texture in a jacket by entering your email address in the box below. You will then receive an email every time a new comment is added. These will also contain a link to a page where you can stop the alerts, and remove all of your related data from the site. Just an observation, but it strikes me that the first outfit would look good indoors, but the second and third would not, and are better suited to outdoors. Not sure about no. 3. Cricket, tennis, regatta, marquee, garden party, al fresco lunch certainly. Not for inside though. I can ask, but generally we’ve avoided specifying anything about cloths because the chances of the cloth being available (given the pictures are drawn from the past five years) are very small. No, sorry. As I said though, the chances of it still being available are very small. Re Nick and your comments, is the middle outfit an outdoors one because of the influence of the hat? The cream trousers though do beckon at being worn on a beautiful, sunny day. The first picture intrigued me because of the tone and cloth of the shirt coupled with the tie. The shirt looks chambray – I have one from Trunk that I love but have shied away from putting a nice navy tie with it. Have you thoughts on that combination, Simon? 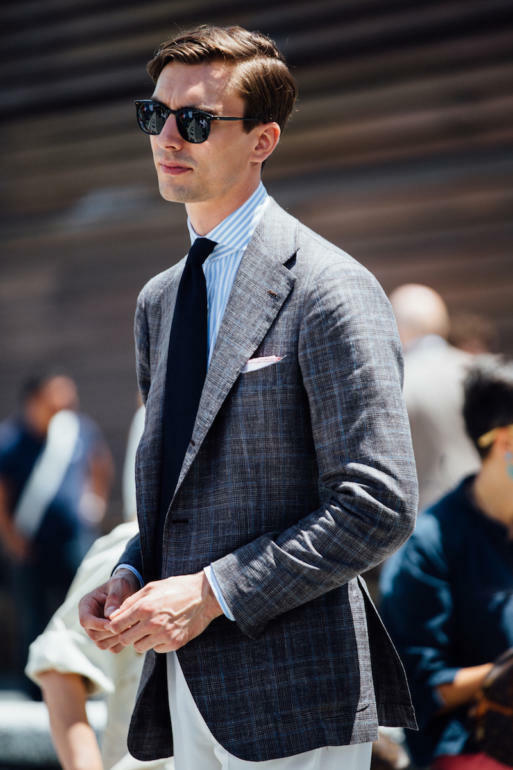 I think it can work nicely – the tie just has to be a little more casual to sit alongside the casual shirt. Thank you, Simon. Navy shantung is the tie I have so will try the combination. Why do you have to ask advice? Why not just stand in front of a mirror and look for yourself? Most of what Simon says regarding style is subjective, so go with your own sense. Skin tone does help too. A pasty Anglo Saxon certainly wouldn’t pull off the second look as well as Mr. Watson. Is there a technical term for the intriguing double button, thick waistband on Mr. Watson’s trousers? It reminds me of the fastening on a stable belt. No, but it can certainly be reproduced by tailors – i have it on a pair of Cifonelli ones. Any possibility there’ll be a someone stocking the book in Australia? Excellent! Appreciate all your work on the site. Currently in Nice for a conference. At the poolside cocktail reception last night there were plenty of variations on the theme of each of the three pictures. Today in the hall mainly picture one and. Beach reception tonight will, I am guessing, be mainly picture three. Will the book be sold in any store in Stockholm? I look at those beautiful broad smiles in pictures 1 and 2 and can’t help smiling in return. Yuma’s look personifies great style. It looks utterly uncontrived and so right for him. I have a slight reservation regarding the round collar on his denim shirt particularly when contrasted with his jacket lapels – personally I’d have gone for something longer – but that’s a small thing and he really looks pitch perfect. Dressing to live rather than living to dress – that should be the Permanent Style mantra. Yuta has is it all going on. This is my kinda style. I can’t do formal much as I’d like to. I just stiffen and cannot relax. I find that this kind of clothing suits my personality, gives a sense of style and is very comfortable for me. Which, let’s face it, is the root of being even remotely stylish. If you aren’t comfortable in the clothes you will never look right. Your grey flannel SB A&S suit in the last section of the book is absolutely gorgeous. Do you mind sharing the cloth details? I searched around but haven’t seen it profiled here. Best, Michael. It’s a Fox Flannel, 11oz, but it’s so old the precise shade and number won’t be available any more.